Bioprinting as a new and emerging research field is now gaining momentum. 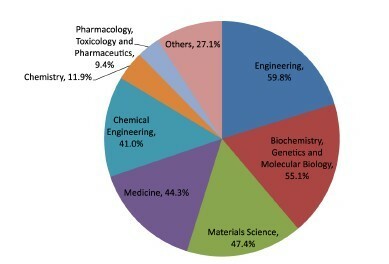 Figure 1 was generated from Scopus by using bioprinting as the search keyword. It shows the trend of the number of published docu-ments (article or review) per year. There are 361 documents in total and 103 are published in the most recent year. There is an urgent for a novel approach to cancer research with 1.7 million new cases of cancer occurring every year in the United States of America. Tumor models offer promise as a useful platform for cancer research without the need for animal models, but there remains a challenge to fabricate a relevant model which mimics the structure, function and drug response of human tumors. Bioprinting can address this need by fabricating three-dimensional constructs that mimic tumor heterogeneity, vasculature and spheroid structures. Furthermore, bioprinting can be used to fabricate tissue constructs within microfluidic platforms, forming tumor-on-a-chip devices which are ideal for high-throughput testing in a biomimetic microenvironment. Applications of tumors-on-a-chip include facilitating basic research to better understand tumor development, structure and function as well as drug screening to improve the efficiency of cancer drug discovery. Alternative strategies that overcome existing organ transplantation methods are of increasing importance because of ongoing demands and lack of adequate organ donors. Recent improvements in tissue engineering techniques offer improved solutions to this problem and will influence engineering and medicinal applications. Tissue engineering employs the synergy of cells, growth factors and scaffolds besides others with the aim to mimic the native extracellular matrix for tissue regeneration. Three-dimensional (3D) bioprinting has been explored to create organs for transplantation, medical implants, prosthetics, in vitro models and 3D tissue models for drug testing. In addition, it is emerging as a powerful technology to provide patients with severe disease conditions with personalized treatments. Challenges in tissue engineering include the development of 3D scaffolds that closely resemble native tissues. 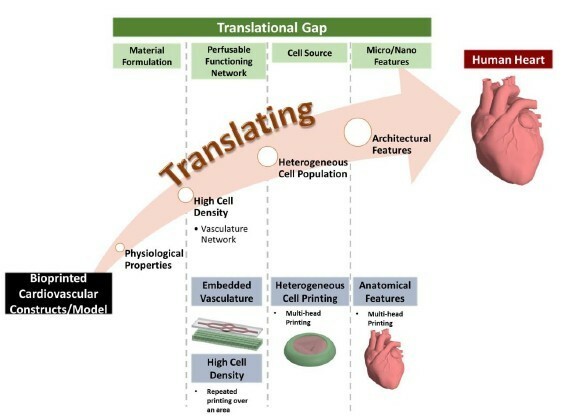 In this review, existing printing methods such as extrusion-based, robotic dispensing, cellular inkjet, laser-assisted printing and integrated tissue organ printing (ITOP) are examined. Also, natural and synthetic polymers and their blends as well as peptides that are exploited as bioinks are discussed with emphasis on regenerative medicine applications. Furthermore, applications of 3D bioprinting in regenerative medicine, evolving strategies and future perspectives are summarized. Fabrication techniques for cardiac tissue engineering have been evolving around scaffold-based and scaffold-free approaches. Conventional fabrication approaches lack control over scalability and homogeneous cell distribution. 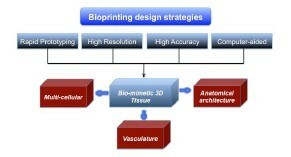 Bioprinting provides a technological platform for controlled deposition of biomaterials, cells, and biological factors in an organized fashion. Bioprinting is capable of alternating heterogeneous cell printing, printing anatomical relevant structure and microchannels resembling vasculature network. These are essential features of an engineered cardiac tissue. Bioprinting can potentially build engineered cardiac construct that resembles native tissue across macro to nanoscale. 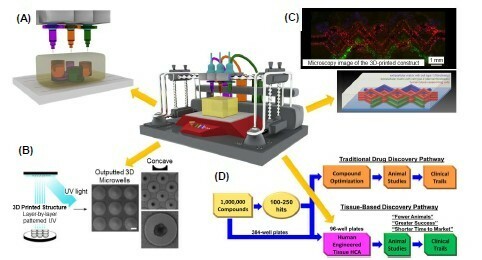 Laser Induced Forward Transfer (LIFT) bioprinting is one of a group of techniques that have been so far largely applied for printing mammalian cells. Bioprinting allows precise placement of viable cells in a defined matrix with the aim of directed three-dimensional development of tissues. In this study, laser bio-printing is used to precisely place eukaryotic microorganisms in specific patterns that allow growth and microscopic observation of the organisms micro-colonies. Saccharomyces cerevisiae var. 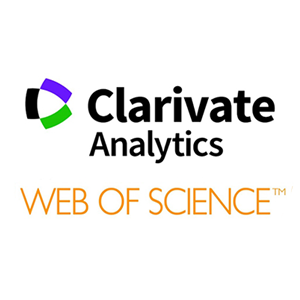 bayanus and Chlorella vulgaris are used as model organisms for this purpose. Growth and development of the micro-colonies are studied by confocal microscopy and the colonies growth rates are determined by image analysis. The developed protocols for printing of microorganisms and growth-rates determination of the micro-colonies, are very promising for future studies of colony growth and development. Int J Bioprint 2016, 2(2), 153-162; doi: 10.18063/IJB.2016.02.002. Biofabrication has gained tremendous attention for manufacturing functional organs or tissues. To fabricate functional organs or tissues, it is necessary to reproduce tissue-specific micro to macro structures. Previously, we developed a custom-made 3D-bioprinter with the capability to print and fabricate 3D complicated hydrogel structures composed of living cells. 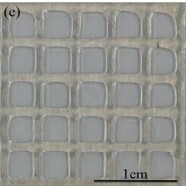 Through the gelation reaction, fine and complicated 3D gel structures can be fabricated via layer by layer printing. Alginate hydrogel has been used mainly due to its good fabricating properties. However, it is not a reliable platform for tissue regeneration because of its inadequate cell-adhesiveness. Therefore, our laboratory is interested to explore more suitable hydrogels for bioprinting and 3D tissue fabrication. In this study, we tried to fabricate 3D gel structures with enough cell-adhesive properties. We focused on hydrogel formation through enzymatic reaction by incorporating materials bearing phenolic hydroxyl moieties and horseradish peroxidase. We examined Alg-Ph and Alg-Ph/Gelatin-Ph gels. We used a mixed solution of applied materials as bioink and printed into H2O2 solution. We successfully fabricated the 3D gel sheet structures including fibroblasts cultures. Fibroblast proliferation and viability were also observed in the 3D gel sheet for more than one week. In conclusion, the hydrogel obtained through enzymatic reaction is a biocompatible bioink material which can be applied to fabricate 3D cell-adhesive gel structures using a 3D-bioprinter. In recent years, hydrogels have been used as important biomaterials for 3D printing of three dimensional tissues or organs. 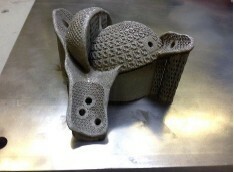 The key issue for printing a successful scaffold is the selection of a material with a good printability. Rheological properties of hydrogels are believed to pay an important role in 3D printability. However the relations between rheological properties of hydrogels and 3D printability have not been extensively studied. In this study, alginate-based hydrogels were prepared as a model material for an extrusion-based printer and graphene oxide was added to modify the rheological properties and 3D printability of the hydrogels. Rheological studies were performed for the hydrogel samples with different formulas. The range of shear rates that the hydrogels suffered during the printing process was deduced. This range of shear rates helped us to select a proper shear rate to investigate the thixotropic properties of the hydrogels. Furthermore, we also defined some measureable parameters to describe and discuss the quality of 3D printing. The present study shows a new approach to analysis of 3D printability of a hydrogel and also provides some suggestion for 3D printing of 3D scaffolds. This paper describes the direct laser write of a photocurable acrylate-based PolyHIPE (High Internal Phase Emulsion) to produce scaffolds with both macro- and microporosity, and the use of these scaffolds in osteosarcoma-based 3D cell culture. The macroporosity was introduced via the application of stereolithography to produce a classical woodpile structure with struts having an approximate diameter of 200 m and pores were typically around 500 m in diameter. 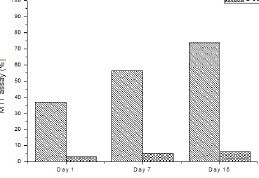 The PolyHIPE retained its microporosity after stereolithographic manufacture, with a range of pore sizes typically between 10 and 60 m (with most pores between 20 and 30 m). The resulting scaffolds were suitable substrates for further modification using acrylic acid plasma polymerisation. 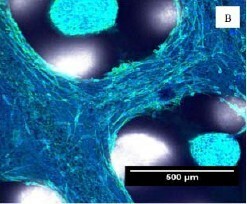 This scaffold was used as a structural mimic of the trabecular bone and in vitro determination of biocompatibility using cultured bone cells (MG63) demonstrated that cells were able to colonise all materials tested, with evidence that acrylic acid plasma polymerisation improved biocompatibility in the long term. The osteosarcoma cell culture on the 3D printed scaffold exhibits different growth behaviour than observed on tissue culture plastic or a flat disk of the porous material; tumour spheroids are observed on parts of the scaffolds. The growth of these spheroids indicates that the osteosarcoma behave more akin to in vivo in this 3D mimic of trabecular bone. It was concluded that PolyHIPEs represent versatile biomaterial systems with considerable potential for the manufacture of complex devices or scaffolds for regenerative medicine. In particular, the possibility to readily mimic the hierarchical structure of native tissue enables opportunities to build in vitro models closely resembling tumour tissue. Additive manufacturing (AM) technologies, in particular selective laser melting (SLM) allows the production of complex-shaped individual implants from titanium alloys with high biocompatibility, mechanical properties, and improved osseointegration by surface texturing. In this work, the possibility of producing a custom-made hip implant from Ti-6Al-4V powder according to the data acquired via computed tomography of the patient is shown. Different heat treatments were applied in order to achieve better combination of tensile strength and elongation by partial decomposition of the martensitic phase. The implant was installed to the patient, postoperative supervision has shown good results, and the patient is able to move with the installed implant. A successful case of applying AM for producing custom hip implant is demonstrated in the paper. Using AM allowed the production of a custom-made hip implant in a short time and decreases the operation time and lessens the risk of infection ingress. Additive manufacturing (AM) is an emerging field that merges engineering and life sciences to produce components that can effectively act as a replacement in the human body. This AM encompasses biofabrication using cells, biological or biomaterials as building blocks to fabricate biological and bio-application oriented substance, device and therapeutic products through a broad range of engineering and biological processes. Furthermore, bioactive coating on BAM surface facilitates biological fixation between the prosthesis and the hard tissue which increases the long term stability and integrity of the implant. In this paper, hydroxyapatite (HA) powder was coated over AM polyamide substrate using pulsed laser deposition. 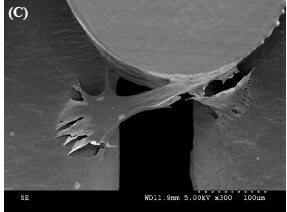 Coating morphology was characterised using scanning electron microscope (SEM) analysis and observed that the coating was dominated by the presence of particle droplet with different sizes. Compounds like tricalcium phosphate and a few amorphous calcium phosphates were found along with HA which was confirmed by X-ray diffraction (XRD) analysis. Fourier transform infrared spectroscopy (FTIR) techniques shows the presence of phosphate and carbonate groups in the HA structure. Nano-indentation and pull-out test reveals that the layer was strong enough and withstands higher load before it peels off. 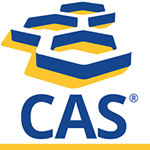 In vitro analysis was evaluated with human osteosarcoma MG-63 cells with respect to the cell viability and results shows that the good viability was observed on coated surface due to combinational effect of Ca2+ and PO43− ions. The multitude of characterisation conducted on the coating has established that coating polyamide with HA results in a positive combination for an implant.